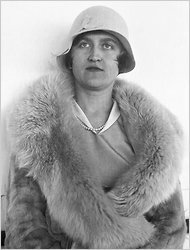 Readers know I’m fascinated by the story of Huguette Clark, the reclusive copper mining heiress who died in 2011 at age 104, and by the legal wrangling over her estate and what appears to have decades of manipulation and mismanagement. Read my earlier posts here. Now the MSNBC reporter who uncovered the story, Bill Dedman, is writing a book with a relative of Clark’s. “Empty Mansions: The Mysterious Life of Huguette Clark and the Spending of a Great American Fortune,” will be published Sept. 10 by Ballantine (Random House). Here’s a link to the cover and copy. The MSNBC stories are collected here. This entry was posted in writing about legal issues and tagged Bill Dedman, Huguette Clark by Leslie Budewitz. Bookmark the permalink.